This PosSizer reduces your position size during equity drawdowns, otherwise applying one of the three Wealth-Lab's standard position sizing choices are applied: fixed dollar, percent of equity, or maximum risk percent. 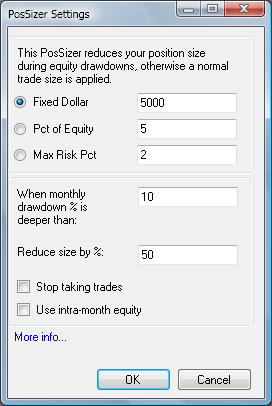 You have the option to either reduce trade size by some percentage during an equity drawdown on the monthly basis deeper than the preset amount, or to completely stop taking trades until next month. The PosSizer can either take the equity value at the beginning of a month, or use intra-month equity. Tip: You can easily use this PosSizer to implement money management rules from Alexander Elder's book "Come into my Trading Room". In Elder's terms, there are two enemies: "sharks" i.e. big single losing trades that wipe a great deal of your capital, and "piranhas" i.e. series of losing trades that take away a small portion of equity with each "bite" (in other words, death by a thousand paper cuts). "The 6% Rule": to protect against "piranhas", stop trading until the end of the current month if equity has lowered more than 6% from end of last month's capital. May not work correctly in Multi-Symbol backtest mode because Wealth-Lab is not synchronizing the different historical data sets when doing multi-symbol backtesting.